Normally I would be using this space today to showcase another fun wedding favor, but earlier this week I saw a story about the new technology being used by Disney Fairy Tale Weddings and I just had to share it with you! 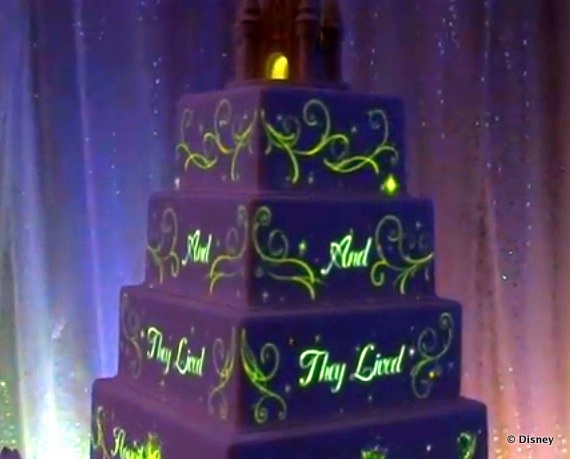 Now, one doesn’t usually think “technology” when talking about wedding cakes, but leave it to Disney to combine the two. They’re calling is “Wedding Projection Cake Mapping” and basically it uses the same projection technology that Disney uses at Walt Disney World and Disneyland for the “projection shows” on Cinderella Castle and it’s a small world. 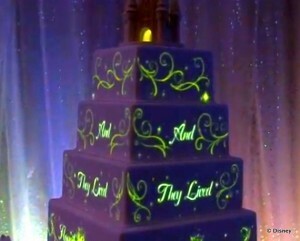 But instead of projecting images on a building they are projecting the images onto your wedding cake! The wedding cake itself features a “blank canvas” of white icing, but couples are still able to personalize the inside flavors of the cake. Couples who wish to have “Cake Mapping” added to their wedding cake need to book their wedding at the Walt Disney World Resort and choose the “Wishes Collection” wedding. You can check out the fairy princess cake here.